As one of the best-selling smart Wi-Fi routers on Amazon, the NetGear 1750 is a device worth the price tag.If you want to find out more read on our NetGear R6400 review. It is known for its extremely fast Wi-Fi speeds and high-powered external antennas enabling it to offer the range and performance you need for large homes. This Netgear r6400 review will show you why this router is the best. True to its premise, the device is designed for more than just internet connectivity. If you value secure connection, the NetGear AC1750 has you covered. It features premium VPN capabilities and controlled guest access. Need I mention the speeds that the 801.11ac standard brings? By installing the router, you will be able to effectively reduce the unnecessary clutter associated with the older versions. The NetGear Ac1750 is a more powerful alternative for the AC170. The 5GHz band delivers speeds of up to 1750Mbps. 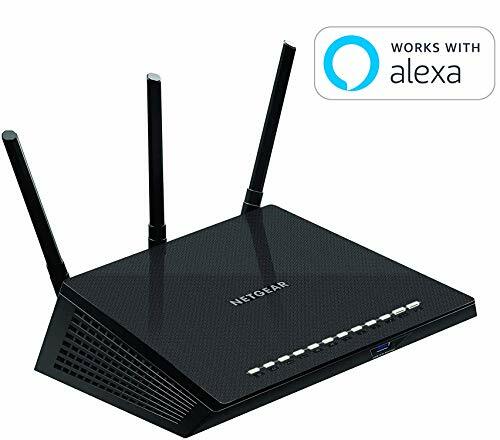 Capable of connecting devices like Smart TVs and game consoles, you will find it to be a more than capable router. The AC1750 Smart Wi-Fi Router comes loaded with many useful features and also includes the NetGear Genie App which enables you to easily set up and manage your network. Concerned about your privacy when online? With NetGear, you need not worry. The device comes with a great VPN support and secure Wi-Fi connections. Not only that, but you will also be able to set up parental controls and a separate controlled access for guests. Beamforming+, with this new technology you can boost the Wi-Fi signal by focusing the signals directly to the connected device. NetGear Genie App is more of a Personal dashboard and it will enable you to monitor, and control your home network. In the AC1750, the manufacturers went a step ahead to include remote access enabling you to be able to manage your network away from home. Available at around $69, the Tp-Link AC1200, is a cheaper alternative to the AC1750. Its wireless coverage is not that good, it more than sufficient for the average consumer. Although the router comes with limited features and settings, it is more than ideal if you are simply looking for an 802.11ac and you aren’t concerned with extremely fast speeds. It is easy to set up and set and considering its fair price, it’s worth checking out. The D-Link AC1900 is a good router with a wide coverage and a reliable connectivity. Speeds are up to 1900 Mbps (150 Mbps more) and just like with the NetGear, the device is easy to set up and use. It’s excellent resource sharing features and remote access capabilities make it comparable to the AC1750. Although at $149, the device is a bit high priced, it’s great features maintain the best seller’s list. The AC1900 is a great upgrade on the AC1750. The device is well designed with a sleek appearance and features to match from an excellent range to full QoS and VPN capabilities. To the average user, the router can be a little complicating to configure and the price tag can be discouraging. Beam-forming technology for signal focusing an area. Dual-band (2.4 GHz and 5GHz). You can switch off the LED lights. Compatible with both 3G and 4g. ReadySHARE feature for sharing files. USB 3.0 port – 10x faster than USB 2.0. It’s a bit larger than your average router. It's time for the features regarding our Netgear r6400 review. One of the major drawbacks of the 802.11n routers is the range of connectivity. The AC1750 router is designed to cover even the largest of houses and offices. Its powerful amplifiers and antennas make the router efficient at delivering great distance at a distance. Tired of sluggish speeds in your home? The R6400 boasts impressive speeds up to 450+1300 Mbps which is more than sufficient even for those of us with high consumption needs. Purchasing a router only for it to start losing signal from time to time can be a really frustrating thing. When it comes to the AC1750, reliability is one thing I love about it. Its advanced features and modern technology minimize the impact of interferences helping you enjoy a more reliable Wi-Fi connectivity. As you open the box you will find one NetGear R6400(with antennas attached) router and underneath a small quick start guide booklet, an Ethernet Cable and a power supply. Everything you need, pretty basic and simple. The R6400 comes with many features including 3T3R MIMO technology, Beamforming+, Wi-Fi Protected Setup (WPS), has it's own firewall protection, on/off switches, parental control, print server and many others that are too many to list. It works with every well known operating system including their older versions. The NetGear is a great fit for most consumers. Once you factor in the numerous unique features that the device introduces, the price can seem to be more than fair. So, if you are having problems with your existing network, it’s time to make an upgrade! We hope you liked our NetGear R6400 review. If you have any more suggestions be sure to send us a message, we are always on the lookout for good ideas.